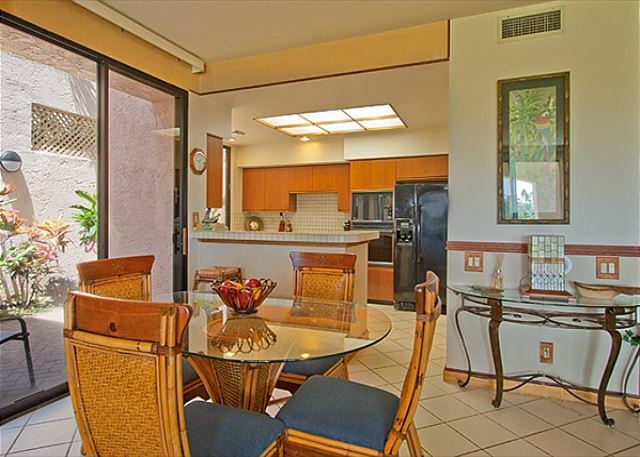 Enjoy a private, pleasant setting here with 1,230 square feet of lanai golf frontage facing a partial view of the ocean waves. Tile flooring throughout--including the freshly re-tiled bedrooms and bathrooms--helps to keep the unit cool. The newly upgraded kitchen and bathrooms have attractive granite counters, updated sinks and fixtures, and open showers. Guest bathroom has both an extra wide bathtub and a standalone shower. All three rooms have updated TVs, plus there is a good stereo system in the living room as well as many books and a few games. 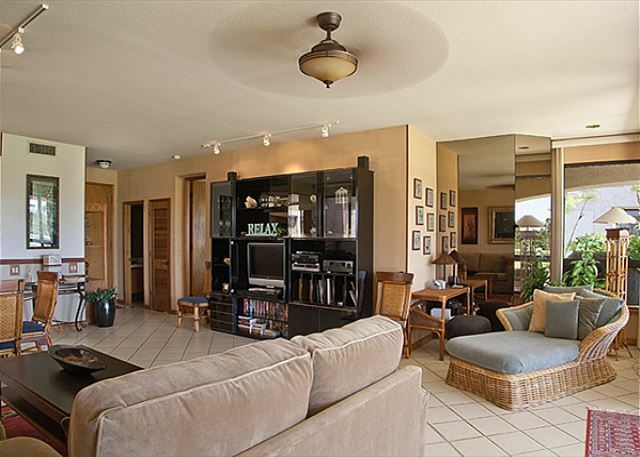 From this wonderfully placed condo the property's freeform pool and jacuzzi are only a few steps away. 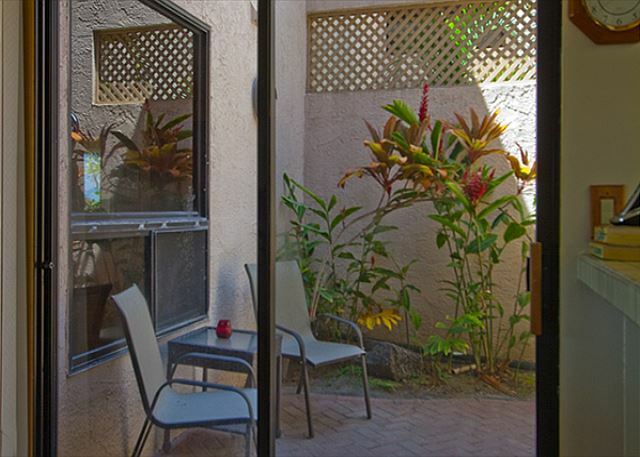 Guests are also within a mere two blocks from the Hilton Waikoloa Village where a variety of restaurant and shopping options may be found. A-Bay beach may be reached through a nearby scenic footpath. And further up the street, accessible within approximately 15 minutes by foot, are two open shopping malls including a large gourmet grocery store. 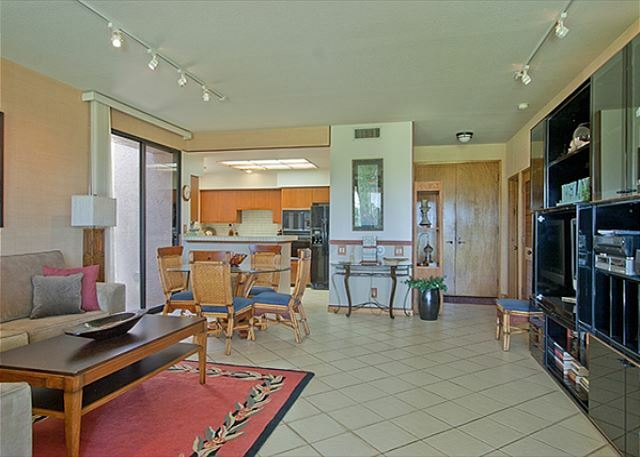 This bright, open unit provides you with ample open living space and two master suites, each with a full-size bathroom and private lanai access. A tiled garden courtyard off the dining room provides an extra outdoor seating spot. The kitchen has all the cooking and serving supplies you need along with up-to-date appliances (note: updated kitchen features not shown in photos). For larger groups and families, this condo's luxurious floor plan and ample outdoor space are ideal. But for a couple seeking that immensely private, get-away-from-it-all island spot this is where it's at. Either way, you will find the sunsets unforgettable. Peggy, the manager provided excellent service. We checked in and out with ease. Whenever I had a question, she promptly replied. If something needed attention eg. Internet connection, she made sure that it was done. The description of the property was as we expected. Peggy was clear about the property's condition that it needs to be remodeled but it was comfortable and clean and we very much enjoyed our stay. It was well stocked with dishes and appliances. We loved the sunsets from the lanai. 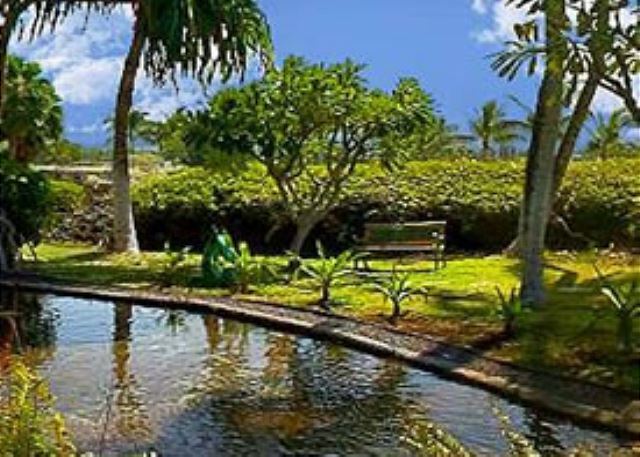 We enjoyed the Lemon Tree restaurant, also the Kings and Queens shopping areas, Waikoloa Village Golf Course, Makani Golf Course, village of Waiamea, Hawi Hilo, Akaka Falls, the Aloha Theatre featuring local talent in Mama Mia, Spencers and A Beach, walks along the ocean not far from the unit. The pool at the Shores was well used by us. Furniture/fixtures/beds are dated however functional. Large lanai is wonderful. The two master bedrooms/baths along with a large living space gave our foursome plenty of room. Peggy, as usual, is great and responded quickly to any requests or questions we had. We will definitely rent from her again. The townhouse is in a great location, easy walk to shops,beach and resturants.The 2 bedrooms are perfect for 2 couples or family with 2 children. The tv's are dated but work fine as does the wifi. with another couple. Peggy is very accommodating and pleasant to work with. We have stayed at other properties listed by this agency and they have all been very comfortable. Also, for anybody who enjoys walking, this home is close to everything.Aloha. The property manager was caring and helpful. Location was great with the King's & Queen's shop right around the corner. The furnishing were comfortable and clean. The pool and common areas were well maintained. We are definely going to stay at this unit again. 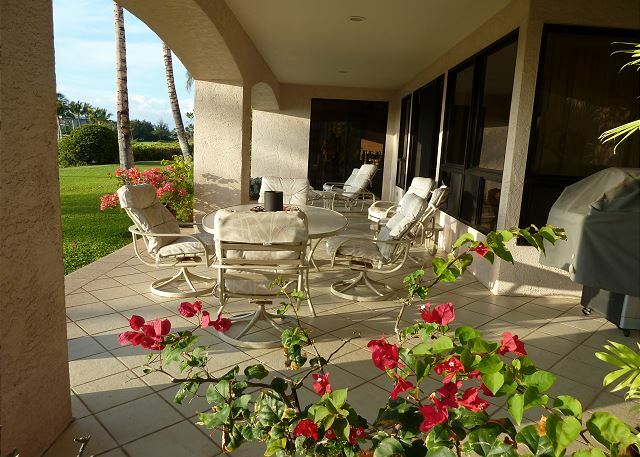 Peggy the agent with Waikoloa Realty was great to work with and was most helpful.